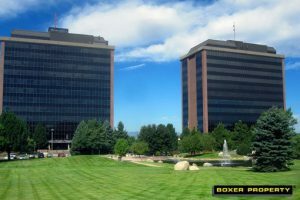 September 25, 2017 (AURORA, CO) – Houston-based commercial real estate firm, Boxer Property, is pleased to announce it has concluded a multi-year, GSA lease negotiation with a government agency for 9,187 SF of office space at 2821 South Parker Road in Aurora, CO. Leasing Representative, Emma Hueber, negotiated the lease on behalf of Boxer Property. Chad Becker of Acro Real Estate Solutions assisted Boxer in obtaining the GSA lease. 2821-2851 South Parker Road, also known as Pavilion Towers, consist of twin buildings with 14 floors each, totaling 291,568 SF of office space for rent. Located in Aurora, CO, the office campus is conveniently situated near the Denver Tech Center and is in close proximity to Highway I-225 and I-25. Downtown Denver is just a 20 minute drive away. Pavilion Towers offers an abundant amount of well-sought after amenities including internet-ready suites, on-site fitness centers, on-site deli, two large training/conference facilities, drop boxes, ample parking, 24-hour programmable access and on-site management, leasing and maintenance services.